In a large bowl, combine the eggs, milk, 2 tbsp. butter, corn, cheese and ½ c. cracker crumbs. Pour into a 11×7 baking dish. Toss the remaining crumbs and butter. Sprinkle over corn. Bake, uncovered for 30 minutes. I love your blog. and love you recipes. Do you read Ree – the pioneer woman? I did a recipe, which she has on her site that is wonderful! it’s the apple dumplings; i was going to send it to you here, but if you have read it on there, i won’t repeat. CREAM BUTTER AND SUGAR. ADD EGGS ONE AT A TIME BEATING WELL. BEAT IN CHOCOLATE SYRUP AND VANILLA. ADD FLOUR AND SALT UNTIL BLENDED. POUR INTO GREASED 15X10X1 GREASED PAN. BAKE 20 MINUTES AT 350 OR UNTIL TOOTHPICK INSERTED COMES OUT CLEAN. (TOP OF BROWNIES WILL STILL APPEAR “WET”. IN SAUCEPAN COMBINE SUGAR, BUTTER AND MILK. BRING TO BOIL UNTIL SUGAR DISSOLVES. REMOVE FROM HEAT; STIR IN CHOCOLATE MORSELS AND MARSHMALLOWS UNTIL MELTED; POUR OVER BROWNIES. REGRIGERATE FOR AT LEAST 15 MINUTES BEFORE CUTTING TO LET THE GLAZE SET UP. YUM!! THESE ARE DIFFERENT AND SO SO GOOD; SO SO CHOCOLATE! Love both your blog and recipes! Oh…and your pics also. 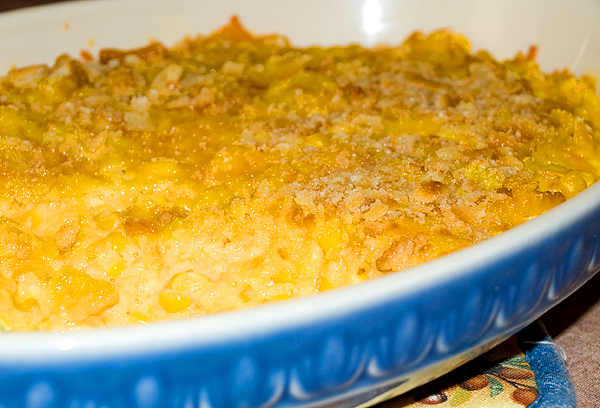 I made your corn casserole and almost ate all of it myself!